As the daughter and granddaughter of hoteliers, Katleen Penel was inspired by hospitality from an early age. She was born and raised at the Hotel Penel, the former Echo de la Mer, one of the first hotels in Koksijde, operated by her grandfather and later by her father. She worked her way up through all the ranks and got to know every aspect of the hotel business. Katleen studied at the Spermalie hotel and catering school. She obtained her teaching certificate in 1996 and immediately took her first professional steps as a teacher at the Ter Groene Poorte hotel and catering school. In 2000, she switched to teaching at Spermalie. 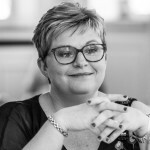 In 2008, she took on the role of PA to the general manager of the Kempinski Hotel in Bruges, and in that capacity, she helped expand the hotel. As a personal assistant and HR coordinator, she was actively involved in the hotel’s personnel policy and public relations. She taught hospitality training to the employees of the Kempinski group and was also responsible for the Schools Policy project. As part of this project, Katleen went on a tour of schools and hotels throughout Europe to promote the group, thereby expanding her worldwide network. The idea of supporting entrepreneurs in high-end hospitality as an independent consultant was born. In 2016, she obtained her Master’s degree in Financial Management from the Antwerp Management School. In recent years, Katleen has been involved as a hospitality consultant in large national and international projects. In 2018, she founded The Glory of Excellence, the company that offers guidance and support for top chefs, and puts them more firmly on the international map. Her brand-new concept offers (future) top chefs the network, coaching and support they need to increase their (international) publicity, visibility and expertise. Co-creation, the exchange of experiences and international collaborations are keywords in her approach. The ultimate goal? Making great chefs excel. To achieve her objective, Katleen Penel travels around the world to expand her extensive network in high-end hospitality and use it to support the top chefs. After all, it is very important for top chefs to connect with other talents in the sector. The Glory of Excellence’s national and international community offers top chefs and their teams as well as aspiring talents the opportunity to get inspired, share knowledge and demonstrate their expertise on a global platform. Worldwide Association of Female Professional Member Katleen Penel can be found on the Association Directory, where she is looking forward to networking with you.